Hello and happy Wednesday Kitchen Fam! So yesterday was officially the first day of spring, and this morning I wake up to snow. WHAT IS UP MOTHER NATURE!?! I mean, where was this during Christmas? Anyway, I digress. I'm really excited about today's post because so many of you have been requesting more keto friendly recipes. I personally don't do strict keto diet because let's face it, bread owns my soul, BUT by my friend Angie has been living the keto life for a while now and I feel like every time I talk to her she's eating what she calls an Egg Roll in a Bowl. One of the things that makes Asian cooking so good for weeknight meals is the fact that it's relatively quick to cook. So before you begin, I recommend prepping all of your vegetables. This way you are just dropping them in the pan as you need them and not rushing to get things done. This is a large meal, so you are going to need a DEEP pan. Add the oil to the pan, place over HIGH heat and allow the pan to get HOT. Once the pan is HOT, add the white part of the sliced green onions, garlic, and ground meat. Cook until browned and no longer pink. I know that traditionally you would use ground pork for egg rolls, and that's fine, but I only had ground beef, so that is what we used here. I think whatever kind of ground meat you want to use will be okay. While the meat is cooking, you will make your egg roll sauce. In a mixing bowl (or measuring cup as I did here) combine the soy sauce, toasted sesame oil, rice wine vinegar, ginger, and Chinese 5-spice. Whisk it all together. Once your meat is fully cooked, you will need to lower the heat to MEDIUM/HIGH and add the cabbage. You will look at this and think "Holy Cow! That is A LOT of cabbage! ", but remember, it will wilt down to about half the size. Cover and cook for about 5 minutes, until the cabbage starts to wilt down. Cover and cook for another 5 minutes, stirring occasionally. And there you have it! 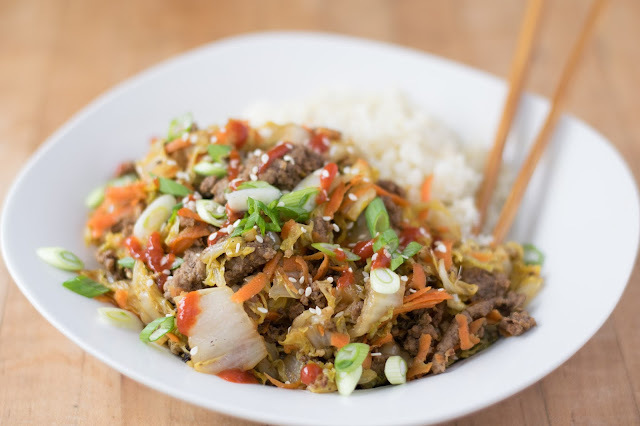 Your Egg Roll in a Bowl is FINISHED! I would like to add this, my friend April of The Tipsy Housewife told me that if I wanted a little firmer cabbage to place the cabbage and carrot into a bowl and add the cooked meat and sauce to it, cover, and let it naturally wilt. To complete my Egg Roll in a Bowl Recipe (and keep it keto) I served it over a bed of yummy cauliflower rice and topped it with the green parts of the onions, sesame seeds, and a little sriracha because spice is good! I'm being totally honest when I say I was blown away at how yummy and filling this was! Even Studhubs requested this be on the menu more often. He also confessed to me that he likes cauliflower rice over regular rice! Who is this man!? If this is what keto living is like then sign me up! I know you're going to love this Egg Roll in a Bowl so get in the kitchen and give it a try tonight! Also, I would love to hear what some of your favorite keto recipes are. I'm always looking for new things to try in my kitchen so leave them in the comments below. 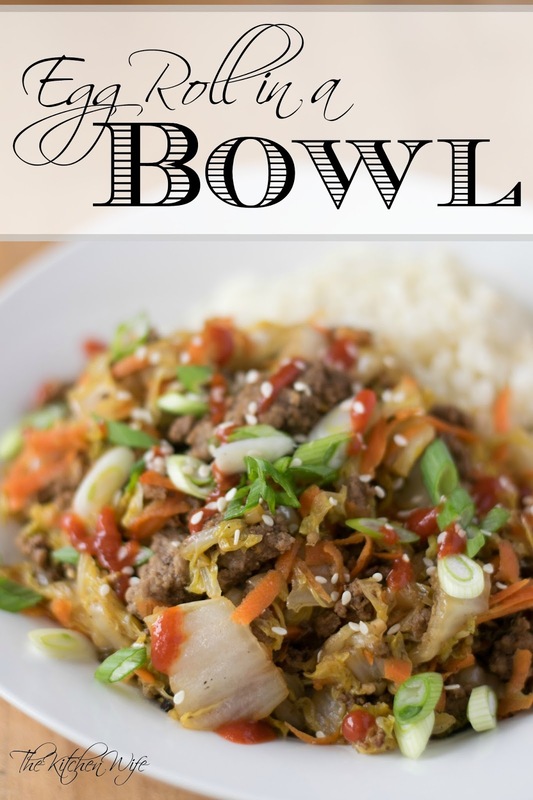 A delicious recipe for Egg Roll in a Bowl! If keto is this good, sign me up! Place a deep skillet over HIGH heat, add the oil, and allow to get HOT. Add the meat, green onions, and garlic to the pan. Cook until brown and no longer pink, about 10 minutes. While the meat is cooking combine the soy sauce, sesame oil, rice wine vinegar, ginger, and Chinese 5-Spice in a bowl and whisk together to make the egg roll sauce. Add the cabbage to the pan, lower heat to MEDIUM/HIGH, cover, and cook for about 5 minutes. Remove cover, add the carrots and sauce. Cover and cook 5 more minutes, stirring occasionally. Serve over a bed of rice (or cauliflower rice) and top with sesame seeds and sriracha. I like the concept. Looks healthy and delicious. Great post! Thank you! I wish I could take credit, but like I said, my friend is addicted! It is delicious though and a much healthier alternative to the tradition deep-fried version!